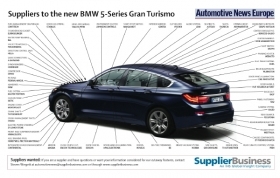 The new BMW 5-series Gran Turismo combines features of a sedan, SUV and station wagon. Many suppliers make this possible, prominent among those being ZF Friedrichshafen AG, which gives the vehicle its driving feel, while Edscha AG and F.S. Fehrer Automotive GmbH improve loading and storage capabilities. ZF contributes an eight-speed automatic transmission, giving a more comfortable ride by virtue of its fast shifting times. The drive experience can be further improved with the addition of ZF Sachs' variable damping CDC, which the supplier markets as Dynamic Damping Control. ZF also supplies the so-called “active roll stabilization” system that provides stabilizing forces to the axles, minimizing the risk of rolling during sharp turning. Another feature is the active steering system from ZF Lenksysteme, a joint venture between Robert Bosch GmbH and ZF. The system aids the driver by varying the steering ratio to best suit driving conditions. Such assistance can make the difference between losing control and maintaining control, particularly during oversteer or when braking when the tires are on different surfaces. The GT has an innovative two-piece liftgate where the lower portion can be opened independently of the whole. Lowering the bottom part creates a small, sedan-like luggage compartment while lifting the whole structure creates a more conventional hatchback opening. This design reduces drafts or exposure to exterior noises that would occur if the whole liftgate had to be opened to load only a small object. Edscha provides the hinges to the liftgate as well as an optional electric spindle drive that opens and closes the liftgate automatically. In addition, the spindle can hold the liftgate at any position between fully open and fully closed, has an electronic lock as well as obstacle detection capability. The electronic spindle, when selected, replaces the conventional Stabilus GmbH-sourced gas-operated springs. Edscha supplies the hinges and electric spindle from its plant in Hengersberg, Germany. Novelis Inc. supplies aluminum for the tailgate inner and outer while Guardian Automotive supplies the rear window (backlite). F.S. Fehrer provides an innovative three-panel partition that separates the passenger seats from the luggage compartment, further shielding occupants from the outside when loading or unloading. The partition can be repositioned to form a flat loading area, offering significantly more storage space. Faurecia SA and Freudenberg & Co. KG make multiple contributions to the car. Faurecia provides the catalytic converter and particulate filter. The components were developed and are manufactured at the supplier's German sites. The catalytic converter is made in Stadeln while the particulate filter is produced in Trabitz. Freudenberg supplies numerous seals to the automobile, including valve steam seals, camcover seals, oilpan gaskets, face seals and O-rings. The 5-series GT went on sale in October 2009. The car's current starting price is 55,200 euros in Germany. It is assembled alongside the the new 5-series sedan and station wagon as well as the 7 series and 6 series at BMW's plant in Dingolfing, southern Germany.